Nesting Platform Cart. 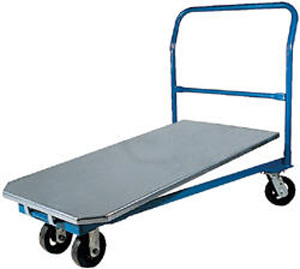 This steel platform truck is nestable to save valuable warehouse storage space. Ideal for warehouses, shipping and receiving areas, lumber retailers, mail rooms and other places where multiple platform trucks are needed. The first cart requires a 30"W x 48"L floor space - each additional truck only adds 12" to the length. Durable powder coat finish.Specs: deck size 24" x 48"; capacity 1,500 lbs; caster size 6" x 2'; caster type - rubber.